HTC One M8 Google Play Edition going away | Android Blast! Most diehard Android fans want a pure Google experience on their phone. Some vendors create custom Google versions of their phones to the delight of the pure Android experience. 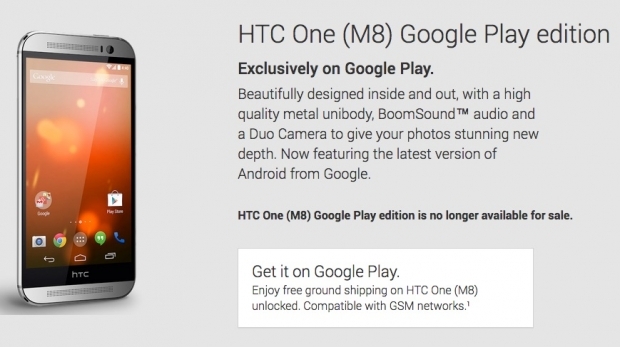 HTC created a Google Play Edition of their One M8, but it appears Google is phasing it out. The HTC One M8 Google Play Edition is no longer listed unders "Phones & Tablets" in Google play. The only way to get to it is with a direct link. Other pure Google phones have also vanished and the One M8 was the last of its kind. Rumors have been swirling that a Samsung Galaxy S5 Google Edition would launch, but we never saw it. Is Google phasing out all Google Play Editions? Time will tell.